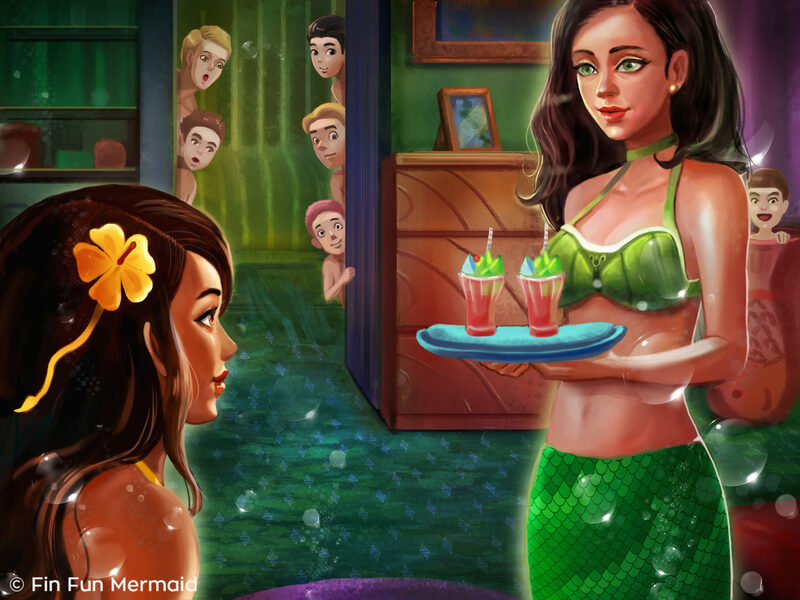 A New Mermaid Tale from Fin Fun Mermaiden, Brynn! The first thing I did when I got home was flop onto my bed of moss, furs, and seaweed and take a deep swig of the salty Celtic water around me. “Ahhh, ‘tis sweet to be home again, isn’t it Fergus?” I groaned complacently as I stretched out on my cushions, spreading my fingers as wide as I could while my little seal friend jumped up and down and all around on my bed. He barked and honked and gnawed on my fingers, so I grabbed him in a headlock and tousled his silky hairs until he went limp in my arms. I chortled deep in my belly, so contented I was to be at home and finally relax. A knock sounded outside and I scowled at the entrance to my room, wishing I could stay alone in peace and quiet forever. The look melted from my face, though as a familiar head of long brown curls and a slightly turned up nose covered in freckles sitting between two excited blue eyes came dancing into the room. 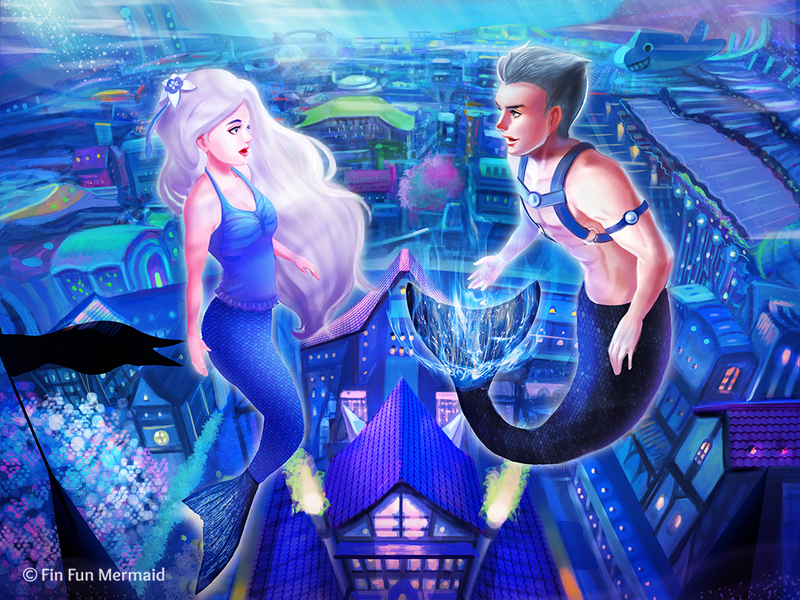 “Finn!” I jumped up and dashed across the room, throwing myself at the tall merman. Finn was my oldest friend, had been since the time we first learned to flip our tails. His mother was my nursemaid, a plump, motherly merwoman with brown curls much like her son’s. When we were just children together we were miserable little miscreants and when I look at her now I wonder how she possibly kept her wits about her while we lurched from one prank to the next! Finn stood back and feigned looking around the room with one hand stroking his chin. “Ah, yes. This ship wheel would look rather lovely up here in this little alcove and—oh yes of course this must be moved, what were ya thinking darling really.” He spoke in a high whining voice and even went so far as to pick up an old ship wheel I’d pillaged off a ship wreck once. I gave him a withering glare and he put it back down, laughing. I went on to tell him about some of the more exciting parts of my time at the MerCouncil. Finn is a great listener. He laughed in all the right places and nodded somberly when I talked of things he didn’t really understand. We sat on the ground with our backs against the wall for a while after and when I finally ran out of things to say, he rose off the ground, pulled me up, and embraced me tightly again. I smiled up at him. I punched Finn hard in the arm and he laughed and rubbed the spot tenderly. 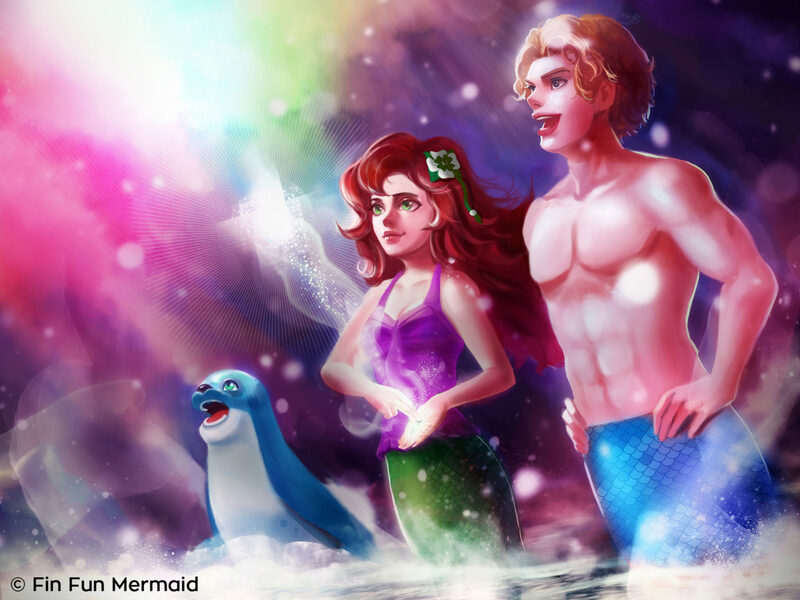 “Come on, you seaslug. Let’s go find an adventure of our own,” I said. We took off, racing down the halls of rocky palace. I nearly barreled into the line of servers who were just bringing in dinner for my mother, father, and little siblings. I grinned at our good timing. If we’d stayed much longer in my room I’d have been dragged down to come dine with them. Together, we exploded out of the front doors with Fergus right on our tails. We laughed as we shot toward the surface, startling a pair of seahorses who had been in the middle of a leisurely swim. Finn and I spiraled around each other, both desperately flipping our fins in a battle of speed. As I started to pull ahead little by little, Finn suddenly lurched forward and grabbed onto my tail. “Ahh! Let go, ya big puffer!” I yelped as I was dragged backwards and he scrambled forward. I lunged for his tail and just missed it, the blue tip slipping right between my fingers. We burst out of the water, Finn only a split second ahead of me and Fergus a little farther behind. Immediately I slapped Finn’s arm and jumped on him, trying to grab his head in a headlock. He grinned his horribly contagious smile and his nose wrinkled, just enough to hide the freckles that spotted his nose and cheeks. He grabbed my flailing arms just below the shoulders and lifted me above his head. Then he threw me over his shoulder, pinning my tail with his arms so I couldn’t move it and laughing at the indignant insults I yelled his way. Fergus barked at Finn and gnawed harmlessly on his elbows before darting around him to my face and nibbling the ends of my hair. Finn’s mischievious smile broadened at my use of his full name. Finally after a humiliating compromise was reached, Finn gently slid me from his shoulder down in front of him earning a wet kiss from Fergus and a good slug to the gut from me. The sun was just settling into its faraway nest in the ocean, surrounded by brilliant reds and oranges when we reached our rock. The three of us clambered on top of it and suddenly out of nowhere Finn brought out a surprise for me. Darcy was a mermaid our age who had recently taken fancy to Finn and flung herself at him every chance she got. Finn was, of course, terrified of her and had a way of disappearing whenever she was near. I grinned and let him keep talking. “I figured, ya know, since ya told me your power was so enhanced now, you’d be willing to try it out again.” His eyes looked hopeful and as I glanced at him and Fergus, their faces were so alike I laughed out loud. 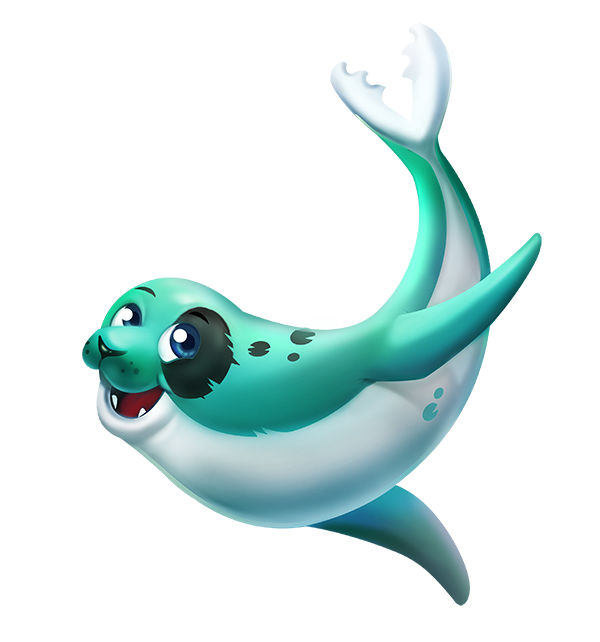 I patted my little seal’s spotted head and nodded to Finn. He grinned and quickly searched through the pile to find the biggest one. Just as the sun disappeared in the sky, I gave Finn the signal and he wound up his arm and sent the glow stone rocketing into the dimming sky. I put two fingers on the ring I’d fashioned out of a shell and one of my “secret” pearls from the MerCouncil and concentrated on throwing my light at the stone. In the distance, the clear stone lit up and suddenly exploded into a brilliant burst of light! Finn whooped loudly and pumped his fist in the air. I gasped and then added my own shout of victory. Fergus took off, quick as a flash to catch the falling pieces of light. As the darkness deepened we continued our fantastic light show, experimenting with my new power. With prompting from Finn, I was able to turn the rising light different colors before sending them exploding into a shower of purple, green, red, yellow, blue, and even pink. Each eruption of light sent thrills down my spine and a new look of pure childlike joy and fascination entered Finn’s eyes. At one point Fergus caught a bit of a green stone in his mouth. He came bounding over to me, so pleased with himself that he was completely unaware of the beams of green light that were shooting out of his nostrils! Finn and I laughed till our sides ached. All too soon it was over and we reluctantly returned home with dramatic goodbyes at the palace entrance. Though even as I settled in to go to sleep that night with Fergus at my side, each time I closed my eyes I saw Finn leaning forward with an elated expression, eagerly awaiting the next light display. It felt amazing to bring that much joy to my friend’s face. 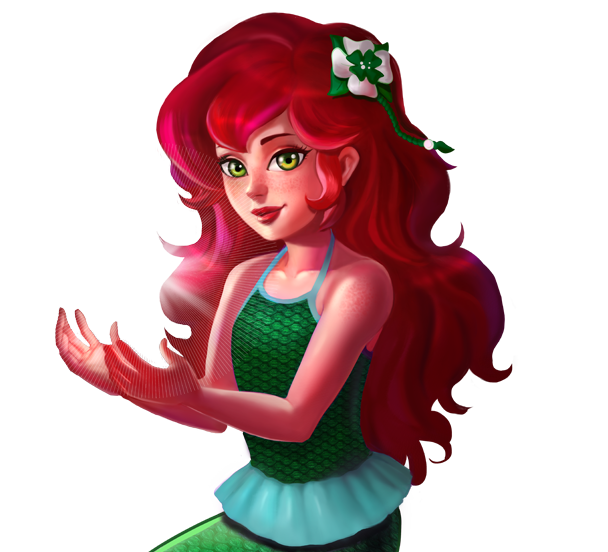 Brynn lives in the North Atlantic Ocean near Ireland, Scotland and England. 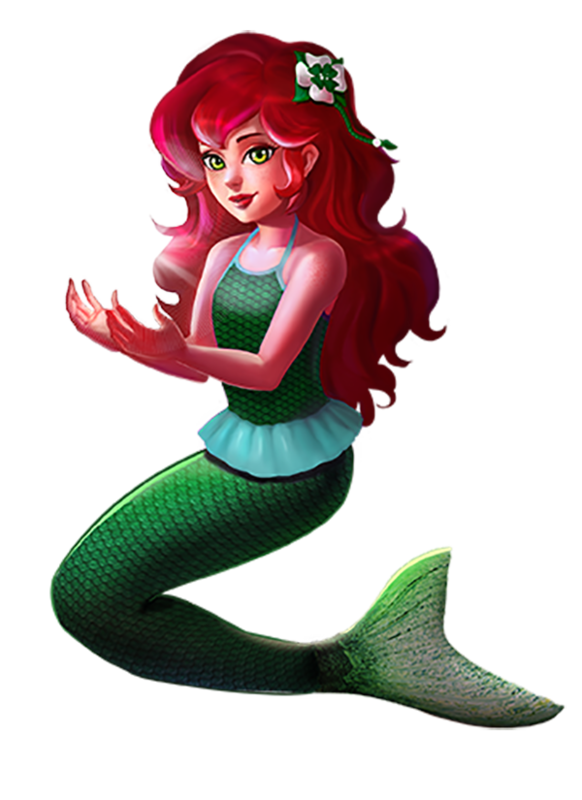 She has the royal Mermaiden power to create light, which she and her FinFriend, a seal named Fergus, use to lead ships to safety through storms. I wanna have a fin friend! Brynn is definitely my favorite mermaidian! I have her tail and everything! I like her red hair… I wish I had red hair. Anyway, love Brynn. WHY IS BRYNNS TAIL NOT POPULAR ITS LIKE 1 OF THE MOST BEAUTIFUL TAILS IN THE WORLD THAT I HAVE EVER SEEN BRYNN IF YOU LISTENING TO THIS I JUST DONT WANT YOUR TAIL TO GO AWAY LOL ITS SO PRETTY!!! I don’t know why, but I totally ship Finn and Brynn. I saw a picture of Scarlet turning into Mariana. Is that true?